Bed and Breakfasts near Borowski Ski Centre for 1 night from Tue Apr 23, 2019 to Wed Apr 24, 2019 within 25 miles, in an Average Nightly price range of £1 to £200. Situated between Brighton and Eastbourne on the south coast of England, Newhaven Lodge offers free WiFi.Guests will have their own key so can enjoy 24-hour access. Housed in a traditional Victorian guest house, rooms have an en suite bathroom, and all have simple dÃ©cor, a flat-screen TV and tea and coffee making facilities. Frequent rail and bus services run into Brighton every 10 minutes, so guests can easily explore the popular attractions. Newhaven Lodge is just a minute's drive from Transmanche Ferry Terminal, with sailings from Newhaven to Dieppe and Le Havre. The White Lion Hotel offers bed and breakfast as well as a welcoming bar and restaurant. The White Lion offers fantastic south facing sea views situated 400 yards away from the sea. The Avondale is a clean affordable friendly family run Guest House in the centre of Seaford. We are AA 3 star Highly Commended and are in the AA top 400 B&B's. We have 14 letting rooms with a mix of single double twin and family rooms. Children aged 4-15 are accepted as children children less than 4 years are not charged. We are open 365 days a year for rooms and functions. All rooms have free Wi fi internet access. We are licensed. This 14th century country house hotel is set in the heart of the Sussex Downs in the pretty village of Alfriston. 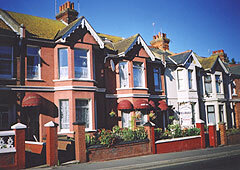 The Deans Place Hotel is just a short drive from the seaside town of Eastbourne and cosmoplitan Brighton. Set in four acres of fabulous gardens Deans Place Hotel has all the facilities for a perfect break. It boasts 36 bedrooms a public bar and guest lounges. The hotel is home to the locally renowned Rosette-awarded Harcourts Restaurant. It also offers an outdoor heated seasonal swimming pool (available from May to September). Guests can enjoy playing croquet and boules in the grounds. Relaxing evenings can be spent on the large terrace which is ideal for alfresco dining during the summer months. Within the beautiful South Downs National Park, Hill Road Studios is situated just outside Lewes centre. The traditional B&B offers modern studios with a private patio and free Wi-Fi. The elegant studio rooms feature luxury beds and a flat-screen TV/DVD player. All rooms have a cosy seating area and work desk, and each has a private modern bathroom. Hill Road Studios each have a compact kitchenette with a microwave and hob. A welcome pack is also provided, featuring fresh coffee, fruit, and light continental breakfast items. With wonderful views across the East Sussex countryside, Hill Road Studios is just a 20-minute walk from Lewes Railway Station. There is free on-site parking, and Brighton is a 20-minute drive away. The Giant s Rest is set in the South Downs National Park in the small village of Wilmington. We are a small family-run pub with Bed & Breakfast facilities upstairs. br / br / br / br / We pride ourselves on our friendly service and relaxed attitude. We welcome an array of clientele such as hikers families and the famous Druids who visit on their way back from The Long Man of Wilmington located just 0.5 mile away. br / br / br / br / The Giant s Rest dates back to the early 1900s not as old as some of our neighbours who claim to go back as far as the 1500s! This makes for a delightful stroll around the quiet village making new discoveries every time. br / br / br / br / We have 2 bed & breakfast rooms available with 1 shared bathroom between them. Perfect for a couple of friends on a hiking holiday but equally they can be let out individually. Both rooms are large with everything you may need for a night away. br / br / br / br / We are well-known in the area for our great food and this continues as the Head Chef sources as much produce locally and makes what he can onsite. It s not unusual to see him making pastry well into the night to keep up with pie demands! br / br / br / br / We are just as passionate about our bar facilities with most drinks being sourced locally including ales ciders lagers gin vodka and juices all produced within a 10-mile radius. We like to rotate our beers so you may not have the same drink twice here at The Giant s Rest! Of course you will find the usual brands such as Guinness Extra Cold Grolsch Orchard Pig Reveller Grey Goose and Coca-Cola. Welcome to The Downs Hotel surrounded by the beautiful South Downs countryside in Woodingdean. The historic village of Rottingdean and the beach are nearby. We pride ourselves in offering you immaculately clean stylish and comfortable rooms with a great value restaurant Sunday carvery and a superb traditional pub. br / br / br / br / You couldn t ask for a better location. We are only 2.5 miles from Brighton town centre - the bus stops just outside the hotel - and we are only 2 miles to the beach. We are within easy reach of the Royal Pavilion Brighton Pier Sea Life Centre and being located on the South Downs also makes the location ideal for walking & cycling. br / br / br / br / The hotel is also near to the University Nuffield Hospital Brighton Racecourse and Brighton Marina br / br / br / br / The superb traditional pub has a beer garden and also offers occasional weekend live entertainment. We have ample FREE PARKING. br / br / A full English Breakfast is included. Crossways Hotel is situated in the heart of East Sussex it is the perfect centre for walking on the Southdown s and is the ideal place to stay for a visit to Glyndbourne Opera Festival shopping in the East Sussex county town of Lewes Eastbourne or Brighton. Seaford Beach can be reach by car in 10 minutes and the historic Herstmonceux Castle is 26 minutes away. All rooms have en-suite facilities and individually designed providing guest friendly and modern comfort. Each features a Flat screen TV Hairdryer and free Wi-Fi access. No trip to Crossways would be complete without dining in our locally and nationally renowned 2 rosette restaurant where the best of local ingredients are treated with imagination to delight our guests. Brighton Inn boutique guest accommodation is a boutique bed and breakfast occupying a fully refurbished 1890s built four storey georgian townhouse situated in a quiet residential street in the fashionable Kemp town area of Brighton. Just one street back from the seafront and a ten minute walk to the pier city centre lanes and the marina we offer a great base from which you can explore all that Brighton has to offer and do it in comfort and style. We have many of Brightons top bars and restaurants on our doorstep for when the seafront and city centre prove too busy or you simply want to chillout nearby. We have seven completely different rooms for you to choose between ranging from our two cosy compact doubles to our medium sized luxury and superior doubles featuring superking beds then our two suites which are larger and feature freestanding roll top baths in the room as well as our bespoke ensuite wet rooms. All of our room types feature ensuite wet rooms with underfloor heating and grohe showers. The White House is a contemporary boutique bed and breakfast in the heart of Kemp Town and just 100 yards from the seafront. Some rooms have sea views two have balconies all are modern and stylish. Located near the seafront and just a short walk from the centre of Brighton The White House is perfectly suited for both business and leisure guests. All ten rooms have been uniquely decorated in a contemporary style and the atmosphere is friendly and relaxed. Breakfast is taken in the dining room or outside if you prefer. The extensive breakfast menu is freshly prepared by the owner-chef using only best quality ingredients. Fair trade Tea and coffee making facilities are available in each room along with a colour TV and free WIFI Luxury rooms also have DVD players. The White house is a non smoking hotel throughout. The Brighton Marina House is a newly refurbished guesthouse ideally situated at the heart of the cosmopolitan and picturesque city of Brighton & Hove. Close to the sea and a short four minute walk to the beach. The newly refurbisthed rooms offer a boutique style design. We are over five floors and we do not have a lift but are happy to help with the luggage. br / br / br / br / The hotel is located close to many attractions and conference venues including the beach (4 minutes walk) piers (9 minutes walk) sea life centre (8 minutes walk) lanes area (11 minutes walk) The Royal Pavillion (11 minutes walk) museums (from 11 minutes walk) North Laines (14 minutes walk). The shopping area of the Lanes is full of boutique shops cafes and resturants so you will find plenty of things to do. br / br / br / br / As a premier bed & breakfast accommodation we offers guests a memorable experience during their stay. We always look to offer customer service at its very best - because we consider our guests to be our most valuable asset. br / br / br / br / All rooms have TVs with Freeview all have a hairdryer wonderful complimentary toiletries a hospitality tray water as well as coffee & tea making facilities. br / br / br / br / Our breakfast is served from 8.00-9.30 on weekdays and 8.30-10.00 on Saturday Sunday and Bank Holidays. For breakfast we offer eggs to order how you like them mushrooms tomatoes and sausages. We also offer juices toast jams cereals and tea. Our coffee machine gives you a choice of various beverages such as freshly ground coffee cappuccino and hot chocolate. Please let us know in advance of any special dietary requirements or allergies. br / br / br / br / Parking - We do not have private parking but we will direct you to locations around the hotel to park your car locally. You may purchase a parking voucher from us that entitle parking in the area for 24 hours. Paskins is one of those enticing harbours you dream of when planning a trip to a Brighton hotel recognisable slightly different comfortable and feel good. It s the sort of place you leave thinking you will always want to return. A gold award winning green Brighton Hotel that has rather found its own way. Not so much a boutique hotel perhaps more discerning a little quirky and forging its own fresh direction. It has distinctive and sometimes amusing rooms and brilliant organic local or fair trade breakfasts. On arrival at the Art Nouveau reception you will be shown to one of the 19 rooms each individual in design perhaps a little quirky but not at the expense of being comfortable. The Art Deco breakfast room continues the charming theme of this Brighton hotel and has a large menu of celebrated choice including a variety of imaginative vegetarian and vegan dishes and some intriguing signature dishes. Although we are only a small Brighton hotel one of several hundred in the City we have still obtained recognition and have become the Times Newspaper hotel of the week enabling our reputation to spread all over England. pets are welcome by arrangement and incur a �10 charge per stay. All rooms at Fab Guest have en suite facilities with wet room showers and complimentary toiletries. Each room has a flat-screen TV and large bed and is accessed via a keyless lock system with secure code. The rooms feature items of furniture and works of art made by local designers and artists. Three of the rooms have views of the sea while others overlook the courtyard garden. br / br / br / br / br / br / In a quiet location off Kemptown s Upper St James s Street Fab Guest is a 5-minute drive from Brighton Train Station and moments away from numerous caf�s and quirky independent shops. It s around 10 minutes walk down to Old Steine and the Brighton Pavilion with The Lanes and centre of town just beyond. br / br / br / br / Kemptown is a great choice for travellers interested in friendly locals nightlife and pubs. Located in a quiet street straight off the seafront in the lively city village area of Kemp Town the Brighton Breeze Hotel gives you the best of both worlds. Here you have everything our famous city has to offer right on your doorstep and the feeling that you re away from it all in a world of your own. The Brighton Breeze Hotel offers comfortable well-maintained accommodation just a few minutes walk from Brighton s bustling centre but has all the benefits of being out of the main city drag - better parking quieter streets and a more neighbourly atmosphere. Brighton Surf Guest House is located a stone s throw from the beach and about 400 meters to the east of Brighton Pier in Charlotte Street ideally placed for easy access to Brighton City centre with its wide choice of both shops and nightlife. Brighton Surf is a beautiful and contemporary Guest House Grade 2 listed Regency town house built in the early 19th century and has been decorated to the highest standard. Customer satisfaction is our goal and to help achieve this we have considered many factors: All our rooms have been designed each with a different theme and style. We have a wide selection of rooms to cater for most needs with single double twin triple and family rooms. All our rooms are en suite and have high quality beds TV tea and coffee making facilities fan free high speed WI-Fi access. Lifestyle Hotel - Alvia is a warm welcoming and comfortable independent guest house set in the heart of Kemptown one of Brighton s most eclectic districts. br / br / br / br / Eight fully en suite rooms we offer a memorable stay in Brighton one of the jewels of the south coast. br / br / Situated less than three minutes from the beach and within five minutes walking distance of the Royal Pavilion the historic Lanes famous for their shopping opportunities and the eccentric North Laine we have everything you could want for a memorable weekend or longer stay. br / br / br / br / Set in a mid Victorian terrace the Alvia has undergone an extensive programme of refurbishment and our rooms have been tastefully redecorated in recent years. We are situated on a leafy avenue which leads directly to the beach but also takes you straight to the heart of Brighton along with the night life and other attractions that it has to offer. br / br / br / br / With free WiFi tea and coffee making facilities in the rooms and comfortable beds you have everything you need to make your stay relaxing and comfortable. br / br / br / br / We look forward to welcoming you to the Alvia - warm welcoming and comfortable.